Most people never have the privilege of meeting a person who is held in such honor and respect as Admiral Arliegh Burke. I had that privilege when I served aboard the admiral’s flagship, the USS Yosemite. Our meeting was not the way I would have liked to meet him, but fate is sometimes a very funny thing. In 1954, I had transferred from the Daly to the Destroyer Tender, known as the “Yo Yo”. One of my responsibilities was the 40 mm Guns Fire control systems. One day I was told to fix the control system for mount 42. This gun mount would jerk hard when it was put into “Local Control”. The repair was simple. It could be fixed by simply replacing two vacuum tubes in the amplifier. While I had my shaking hands inside this amplifier, with it’s many high voltage contacts, I noticed out of the corner of my eye, that my buddy, Third Class Gunners Mate Langford was about to pull off one of his goofy pranks. He was noted for them. Suddenly he hollered, “think fast”! With that, I looked up to see a temporary wooden gun plug, called a Tompkin, come flying at my head. With reflex action, my hands shot out of the amplifier and caught this flying missile. I had to catch it or it would have gone over the side and down onto the pier. “Langford, I told him, if you throw that thing again, I’m not going to catch it”. Well, as I got back into position, with my hands back in the amplifier, I could see that Lankford was ready to let go with another one. This time I simply ducked as the plug sailed over my head. This seemed funny enough, until we heard a loud “BOONG”. Langford and I quickly rushed to look over the side. There directly below us was this was this bright shinny black Chrysler sedan, with a large visible dent in the center of its roof. Within seconds, duty officers came rushing up to us. Each with a report chit in his hand. “Name, rank and serial number”, each one was shouting. All were accusing us of graba____. I had to think fast to come up with something that would not get Langford in trouble, as well as cover myself. All the shouting suddenly stopped with the command, “Attention on deck”. The crowd parted, and up came this little guy, Admiral Arleigh (31 knot) Burke. He was wearing an old bathrobe and shower shoes. Everybody was shouting over each other, trying to be the one who would tell the admiral what they thought had happened to his car. Admiral Burke silenced everyone. He then came up to me and asked me what had happened. I told him that the gun was not behaving right, and that I was trying to settle it down. I told him that when I turned the mount on, it shook and a plug fell out of a barrel. Because this gun was pointed straight amidships, when the plug fell, it fell down onto the pier. When we looked down, there was this car parked right under us, and it had this dent right in the middle of the roof. Admiral Burke then reached down, picked up a plug and handed it to me. Looking straight and deep into my eyes he said, “Show me”. I took a deep breath, put the plug into the end of a barrel, as lightly as possible, without being too obvious. I then pulled the gun control lever into the ON position. The mount began to shake violently, and the plug fell out onto the deck. The admiral then turned to the XO and said, “That’s what I pay insurance for”, and he walked off. With that, everyone else left. I then let out about 2 minutes of air. I knew that I was now the clear. But later, when I think back at this incident, I remember the look in the eyes of the admiral when he told me to show him. I believe he knew exactly what had happened. 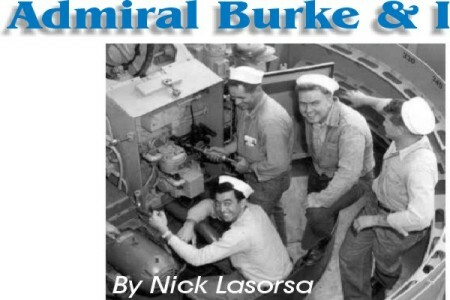 ADMIRAL BURKE was a real destroyer sailor’s admiral.